I have always had a love of color and a fascination for blending them and learning all about primary, secondary, and tertiary colors. 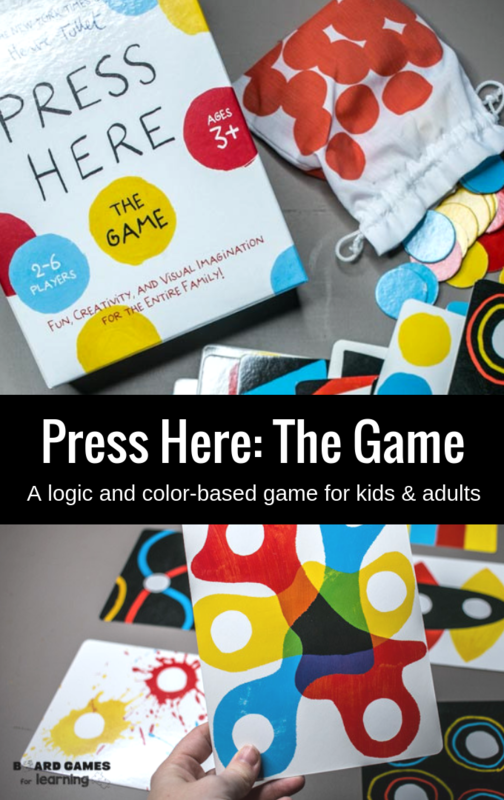 While “Press Here: The Game” mainly focuses on the three primary colors, it’s a wonderful introduction to logic for even 3 year olds [or older; in fact it’s a great game for elementary kids in general] and a fun way to play with primary colors. Use different mediums such as crayons, markers, pastels, paint, etc. and see which one creates the best blend of primary to secondary colors. 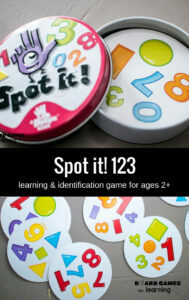 Create different patterns and ask the child to complete the patterns. This could be with colors, shapes, or anything to continue to reinforce the skills from the game. We have had this one for several years and introduced it with each child around the age of 2 or 3. 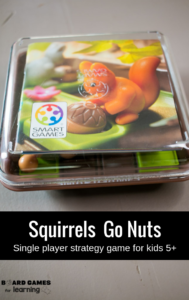 We find it to be a great game that spans multiple ages and because of the need to justify answers, it helps glean insight into how their minds work, but also makes it engaging for older kids, parents, and teachers as well. 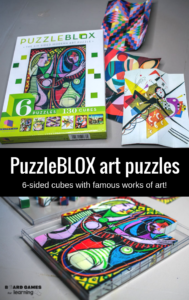 With a box full of two-sided boards and each board having an “easy” side with three dot placements and a “harder” side with 6 placement options, Press Here is a fun game to help even some of the youngest children learn about colors, patterns, and logic. This game predominantly features the primary colors. 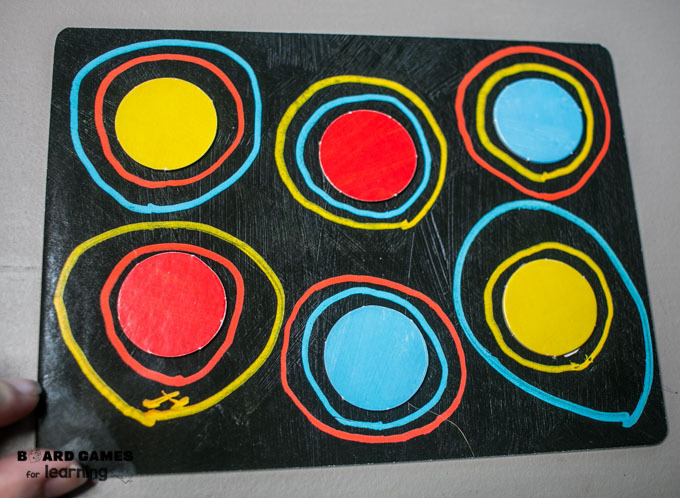 However, some tiles feature color mixing and the secondary colors such as the board below. Every board is different and allows kids to explore colors in a unique way. Below you will see two different variations on how this board could be played. The top row can be justified in that every circle set shows all three primary colors. However, the bottom row is correct as well and could be justified as the pattern “1, 2, 2” for color order and all colors and sets are complete. Of course the final way this card could be played is that you could represent a pattern such as yellow, red, yellow then red blue, red and so on. In general, as long as the answer could be justified, there are variations to what can be played and each player has to continue playing under the same rules and assumptions as the first dot that went into play on that card. 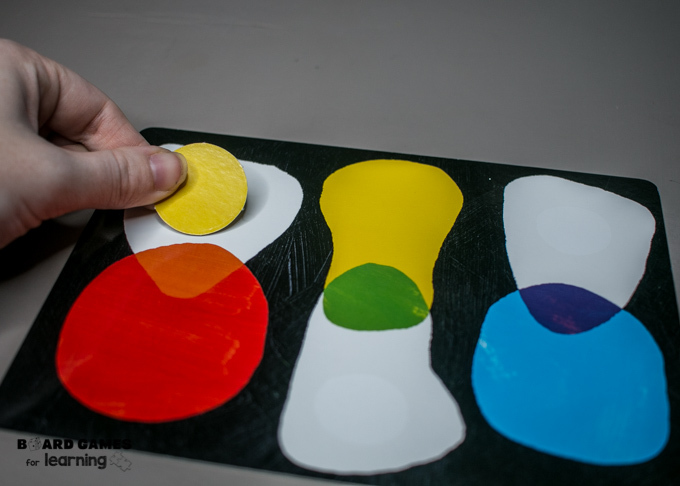 Some boards have only one right answer such as with color mixing. The game contains multiple boards that are all two sides. There are ultimately many ways to play, but our most typical one is to try to collect the most boards by completing them under the same logic rules as each was started. So in some ways there’s also a memory element to the game when the creative logic becomes more complex on the 6-spot side. 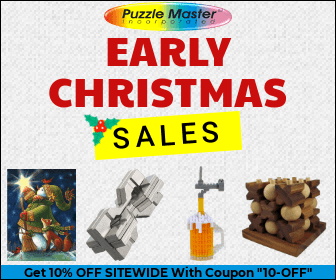 Not only is the game based on a fantastic, interactive book, it also is unique in that spans a large age range, can be played with or without adults, and in many ways is self-correcting… or at the very least competitors can help correct if the logic doesn’t make sense. It makes colors come to life and makes logic as easy as red, yellow, and blue.